Over 2,000 first-graders in Vancouver Public Schools were joined by family members last week to enjoy a free breakfast of green eggs and ham and embrace the value of reading. Part of a week long celebration honoring the birthday of children’s book author Dr. Seuss, the breakfast is a 21 year-old tradition begun by Beaches Restaurant and Bar owner Mark Matthias. 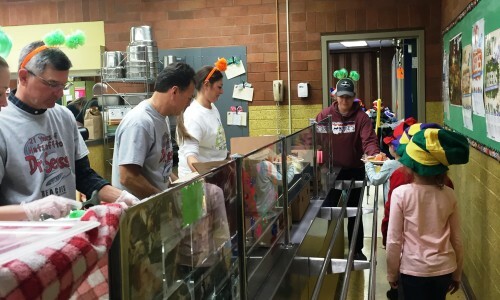 With assistance from 125 volunteers, Beaches served green eggs and ham to first graders and their families at all elementaries in the Vancouver and Evergreen districts as well as others throughout the county, reaching a total of 51 schools. Many local businesses provided support to Beaches Restaurant and representatives from The Columbian helped Beaches staff serve the breakfasts. Each first-grade student in the Vancouver School District also received a book donated by Riverview Community Bank and distributed by the Foundation for Vancouver Public Schools. Riverview staff were on site to hand out “Cat in the Hat” style hats. Many schools held book fairs and invited special guests to read to students. Vancouver’s Barnes and Noble store hosted a reading by Vancouver School District Superintendent Dr. Steven Webb and donated a portion of book sale proceeds to local school libraries. Additional coverage of the Green Eggs & Ham breakfasts can be found on the Columbian Newspaper website.